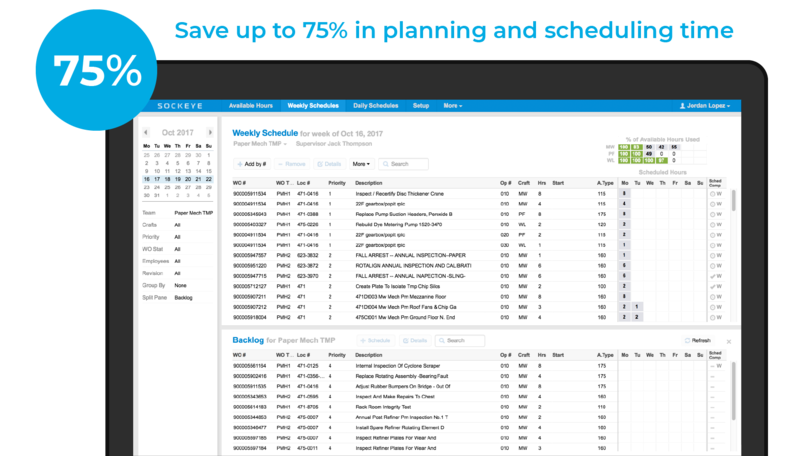 Schedulers and maintenance supervisors need the right tool to effectively schedule weekly and daily work orders. Most CMMS systems lack the functionality needed to schedule maintenance ... leaving schedulers to rely on spreadsheets. But spreadsheets were never designed to assign the right crew to the right work orders at the right time to keep equipment running reliably. Are spreadsheets to blame for ineffective maintenance scheduling? Work orders are in your ERP/CMMS with labor availability in another system. After copying data to spreadsheets to build a schedule, you learn a mechanic is sick and operations can’t take down a machine. It’s back to the drawing board. More time is wasted. Are the limitations of spreadsheets holding you back from optimizing workforce utilization to schedule more maintenance work? Sockeye maps naturally to your work order scheduling process and is so effective it reduces your scheduling time by up to 75%. Sockeye seamlessly integrates all current work order and labor data needed to schedule and track maintenance work. With Sockeye, you can reduce the potential for errors and delays – saving you time and frustration. Sockeye fits the maintenance scheduling process perfectly. Sockeye puts work orders and labor on one page. All the data is available in real-time and organized the way you need it. Sockeye helps you control your weekly schedule, so you can control your plant. Schedulers and maintenance supervisors trust Sockeye to assign the right crew to the right work orders at the right time, helping shrink the backlog and decrease reactive work by up by to 20%.